In our previous article(written by Rajat Grag) we saw the Top 8 Reasons Why your Blog is not Approved by Google AdSense? You might have seen many articles on different site. You might read the entire article but still your AdSense didn’t approve. Why? I think all people are providing the same article. They don’t know the real thing about AdSense. 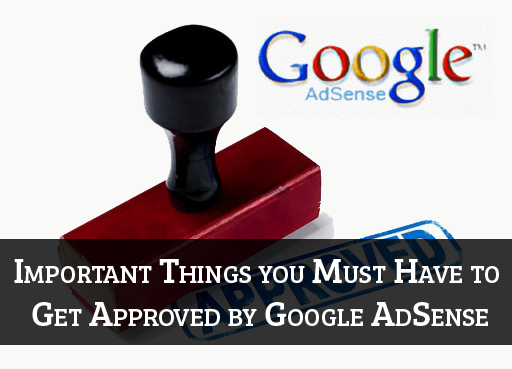 Many Blog told many tricks to get approve your AdSense account. But all things are useless there are no secret behind anything. You can apply for AdSense account even if your blog is 1 month old. It should have good, unique content in the site, with lot of comment. If your work is not unique then no one is going to see it even Google also. When you submit your site for Google AdSense account they review your blog completely they check your all article and see whether they are unique or not. Only uniqueness is not important quality matter a lot in this part also. So make unique as well as quality content. As we all know quality article is the king of the site. Make your navigation and blog design unique and easy. Google love those site only which good user interface. Try to improve your design and navigation. For Better navigation put all your important pages in the menu bar. This is helping you a lot and it will become easy to get AdSense account. Most of the time Google accounts disapprove saying that you have bad design and navigation. That why it is the most important factor for the site. If audience is leaving your site because they face difficulty in finding the content then Google will not going to give you AdSense account. So think about it. If you are buying traffic from some site then this will not help you. Search Engine traffic means a lot for the blog as well as bloggers. If you are getting good amount of traffic from search engine then you have more changes to get the account. For this you have to make the content SEO friendly and with proper keyword. If the entire thing are good then your posts going to be on top search. Make sure you have make this page before applying to AdSense account, make new page in your site and locate them in the menu bar. If you have made your site popularly then you will get AdSense account. What pages you Have to Make? If you are using other advertising networks then remove them before applying for an AdSense account, because Google don’t want you to use other advertising network and more advertisements means less user experience, and Google always focuses on rich user experience, and some advertising networks are compatible with AdSense not so avoiding any kind of ads before submitting your application. When you make your site you must linked to analytic and webmasters, If you are going to apply for Google AdSense then they will check this. From there they get accurate information about your Blog traffic and other things. +Aditya is a 19 years old blogger Currently living in Bareilly, India. He is a Skilled Blogger & an addicted Web Developer and Student. He blogs at Blogging Tips Guru(Blog No Longer Active). This article is really informative. I Learned new thing from this article that i don't know about adsense. Thanks @Aditya for sharing this article. Hope this will help you a lot while applying in adsense. Thanks For the comment. Needful post for the newbie bloggers! Its nice, but I got approval for my single page article in the year 2008 within half-a-day. Thanks for writing the nice n clear information! That was great within Half a day you got the adsense. You might have written a great post that's why you got it. Thanks for the comments ^_^. I am read your last post. But i have some thing question, but after reading this post all the quires to be short out. Great. Thanks for the comment. If you have any more quires then you can ask to the us. Can you please eloborate "Link Your Blog To Analytics and Webmasters".......?? I am also yet to get approval for google adsense account on my blog. Kindly assist. Nice article. I agree that having unique content is a must.